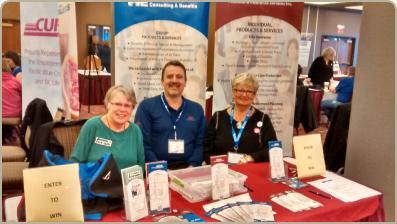 WE Consulting & Benefits provides benefits for BC FORUM members. From left are BC FORUM Board Secretary Miriam Olney, Mike Porteous, WE Consulting & Benefits and Diane Wood, President, BC FORUM. Photo was taken at CLC Winter School, January 31, 2016. With BC FORUM, you have a group to turn to when you want action, and your voice will be backed by the power of the organization’s collective voice. In addition to organizing community forums and rallies on issues that matter to our members, we also produce The Advocate, a quarterly newsletter that helps our members stay informed on current issues and initiatives. Annual dues for membership are $20 (three year memberships are available for $49) and we recommend you check with your union as some affiliates will pay your first year membership dues (current May, 2017: BCGEU, HSA, MoveUp, CEU, CUPE 386, UFCW, Heat & Frost, Unifor 2301 and LiUNA 1611). As a member of the BC FORUM, you will automatically be covered by our $2,500 Group Accident Death & Dismemberment (AD&D) Insurance Plan. Spousal coverage is also available at an additional $5/year. Published in Summer 2018 issue of the Advocate, starting on page 7. WE Consulting & Benefits Services Ltd.